Well, it started to be a morning post, until I ran updates on this seldom used, old and slow as hell laptop. Now it’s afternoon, but I’m still polishing off the coffee pot, so all is good. These are what just picked field peas look like. Some people call them crowder or Southern peas. 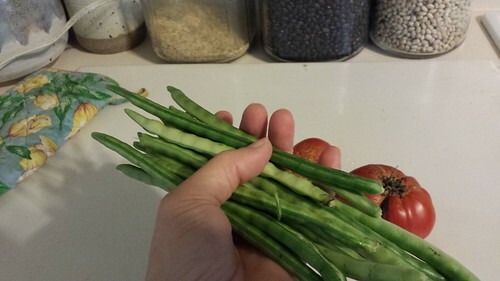 They are meant to be eaten fresh and you can snap the immature pods to include with the shelled peas. Not the same as black-eyed peas, although very much related. These are a combination of “Dixie Lee” (I know) and “Whippoorwill” which I bought at Monticello years ago. I’ve been saving these seeds for years. Today is a cool overcast day after catching some heavy rains from the remnants of Harvey passing to our west. This August and early September is bizarrely cool. I’ve been able to turn off the air conditioning for much of it. At the same time, the place where I wanted to migrate, western Oregon, has been burning up, literally, and temps there have far surpassed those here in our part of the South. It’s a different world, and one that will continue with the big weather surprises. I believe we passed the tipping point several years ago, and now we will have to reap what our oligarch governments have sown. Politics aside, I feel like I am on the upswing. My attitude has improved in a very big way. Maybe it is due to me feeling like I’m doing the best that I can within my circumstances. One of the Four Agreements is “Always do your best.” Your best will change according to your circumstances. The line between self-care and trying to save the world is hard for us INTJ and Enneagram One types. I have physical issues that have to be attended to. Going to the orthopedic doctor and physical therapist opened a huge awareness of how my posture and ergonomic set-ups have affected my body. Right now I have my laptop high on a table and I am standing up looking down at it instead of straight ahead. My doctor informed me that the usual advice to have your monitor at eye level was hurting me. I’m already seeing the results of lowering my screens and doing the neck exercises to stretch that shortened muscle group on the back of my neck. The tapestry loom is a bit harder to deal with. I’m having a harder time adjusting. I don’t want to crank it down because the tension problems on this warp are massive and I’ve decided to weave this tapestry as is on the loom and cut it off to rewarp for the next one when I’m done. This means I either have to stand and look too far down or sit and look just a little bit up. I’m standing and stepping back a lot to look at it, which is probably what I should do anyway. I could raise the loom itself or put the stool on a platform of some kind. I should probably invest in a chair with back support that I can crank up and down. Anyway, that plus waiting to hear when I will schedule my gallbladder surgery has my mind focused on my health more than usual. I’m determined to get to the other side of this challenge. I’ll try not to write about it much more, but this is my journal more than anything else. I gave up it being a public forum a long time ago when everybody in my world switched to Facebook, and that’s where I get most of my interaction with my current and former readers. 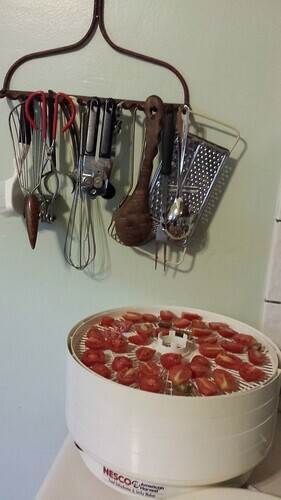 Today I am drying more tomatoes in the dehydrator. Many of my kitchen utensils are hanging on an old rake that I repurposed. Later we’re heading to Costco to use up a credit Sandy got when he used their services to replace an HVAC unit in the condo that he rents out. We are both trying to take our lunch to work more often, and he doesn’t care for the more veggie organic low-fat food that I take to work. I would lose weight if I didn’t like beer so much. Thank God I am not on a low carb diet! I’m already missing ice cream so much and look forward to eating it again after my surgery. I’m trying to change my attitude about cooking, which I used to enjoy but in the past few years it felt like drudgery. I don’t know why. Maybe keeping the kitchen cleaned up will help! Here’s how I keep the cats away from my tapestry. They damaged several of my larger woven pieces when they were kittens and I took them down. 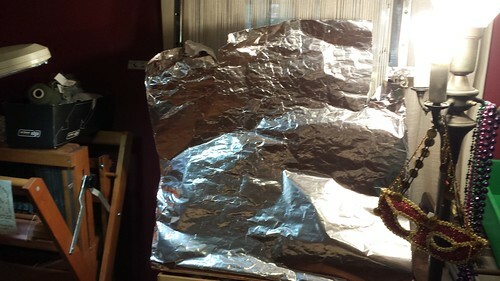 Turns out my cats all HATE foil. It is an effective deterrent! Maybe I should use it in the garden as well, although that blasted woodchuck seems to have moved away. I’ve got an idea for a book that is based on the parking lots that I cross every weekday on my walk to work and the things I find in them. Sorting through ideas now. I love the canvas book I made in Leighanna Light’s FOBA class this summer, and that is tempting. I wonder if an accordian style book or single bookboard pages in which I can embed up to quarter inch objects would be better. In any case, I’m also gessoing some canvas for another canvas book, and still working in the one that I made this summer as a journal of that trip.